LOWELL, Mass. -- After being banned from signing amateur international free agents in the 2016-2017 signing period, the Red Sox signed several older Latin American arms during the 2017-2018 signing period for nominal bonuses. One of those players was 20-year-old Dominican right-handerAlexander Montero, who received $10,000 last July and showed an interesting two-pitch mix during Spring Training. Three months later, Montero’s stuff has already taken a step forward as he makes his stateside debut with the Lowell Spinners. Through two starts, Montero has thrown ten innings, allowing only six hits while striking out nine and walking only two. Montero is listed at 6-foot-3. 180 pounds and has some projection remaining in his frame. He starts on the third base side of the rubber with a wide base. He doesn’t utilize a wind-up and comes set at his chest before utilizing a short arm action behind his back, hiding the ball until late. For the most part he comes over the top, but he varied his arm slot at times, with some pitches coming from a more high-three quarters arm slot. During Spring Training, Montero topped out at 92 mph, but now he is up to 95 mph. During the five-inning stint scouted, he sat 92-94 mph and held his velocity for the most part, still touching 94 in his fourth inning of work before tailing off a tick to 91-93 mph in his final inning. The pitch showed cut at times when his arm got out ahead of his delivery and came across his body, with two-seam action at other times. Montero generates easy velocity and the pitch jumped on hitters. Montero featured a pair of secondary offerings: a split changeup and a slider. The split change is ahead of the slider at this point, showing late, diving action down and out of the zone. He threw the pitch 85-89 mph, but it was inconsistent and he didn’t really get it going until late in the outing, when he recorded a pair of swinging strikes with it, one for a strikeout. Montero threw his slider 81-85 mph, with the pitch flashing average, but it was also inconsistent. The shape and depth of the pitch varied, with some more vertical when he got over the ball and others with more tilt when he got on the side of it. Montero has a long way to go developmentally, but with the early makings of a three-pitch mix and an athletic, projectable frame, he is an intriguing arm in system that needs some under-the-radar players to take a step forward. 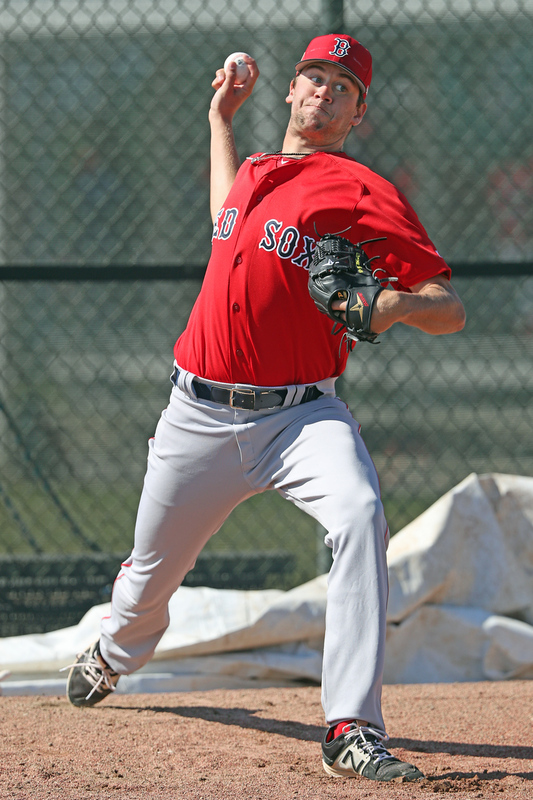 At Spring Training, 2017 22nd-round pick Hunter Haworth was a pitcher we heard had a good camp and could be a potential sleeper pick to rise up prospect lists in 2018. But although he seemed poised to make good on that intel when he made the Greenville Drive to start the season, Haworth’s initial stint in full-season ball lasted just four starts, over which he allowed 30 runs, 21 earned, on 32 hits and 8 walks in 15 2/3 innings, although he did strike out 16 hitters. With a 12.06 ERA and 2.55 WHIP, Haworth returned to Fort Myers to right the ship in extended spring training. After a one-game return to Greenville, in which he exorcised some demons in a successful four-inning relief outing (4 hits, 2 runs (1 earned), 1 walk, 3 strikeouts), Haworth is now part of the Lowell rotation. Haworth has a strong pitcher’s frame, listed at 6-foot-4, 210 pounds. He has minimal remaining projection in his frame and throws from a high-three quarters arm slot. 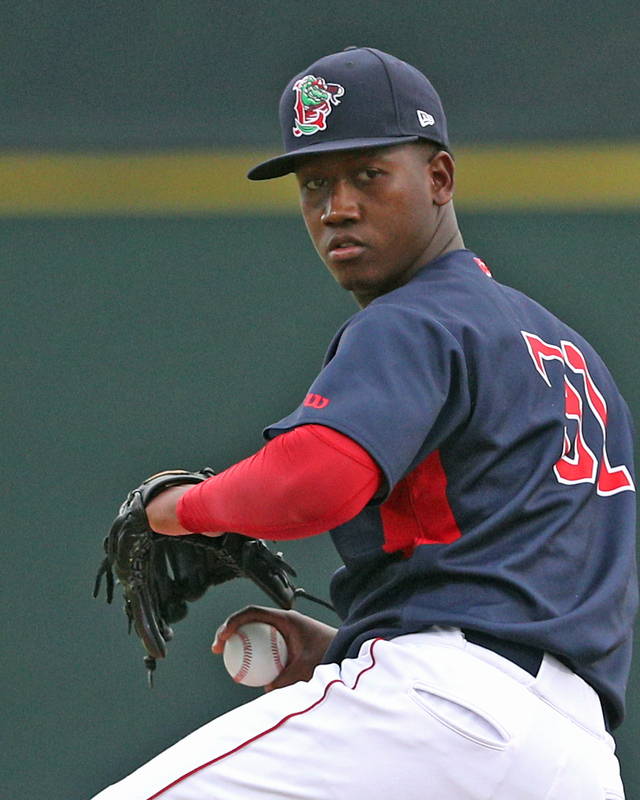 Haworth drew the start in Lowell’s home opener and showed off five pitches, an arsenal that likely will be cut down to by a pitch or two as he moves up the system. Haworth’s fastball settled in at 91-93 mph after coming out at 93-95 mph in the first inning. Both are an increase from the 89-91 mph range in which he sat during my spring training look. Haworth tended to overthrow the pitch at times, and his command and control suffered as a result. Haworth complimented his fastball with a changeup, splitter, curveball and slider. His splitter showed the most potential, coming in at 81-83 mph with late dive and the bottom falling out of the pitch when it was on. He got the most swinging strikes of any of his secondaries with his splitter on this occasion, with the pitch flashing average potential. Haworth threw his changeup 81-84 mph, but he tended to telegraph the pitch by slowing his arm down. His two breaking balls seemed to run into each other at times, with his slider usually 83-84 mph and curveball 79-80 mph. The slider had more tilt, but was on the loose side, while his curveball was short with vertical break. He also threw several breaking balls on the slurvy side in between the two pitches at 80-82 mph.